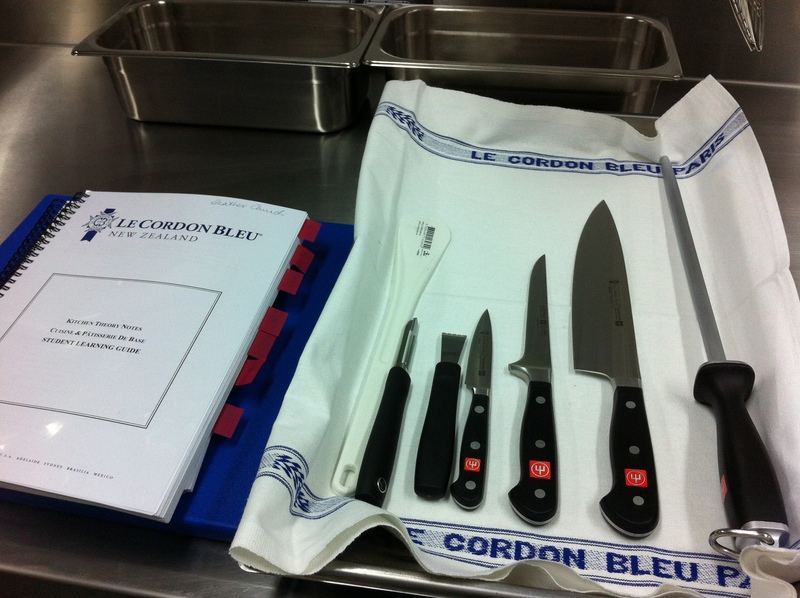 There aren’t enough superlatives to describe my first week at Le Cordon Bleu. I have experienced every emotion you can imagine. I have felt extreme excitement and exhilaration along with serious bouts of the jitters. One minute I’m thrilled at the prospect of 10 weeks in this extraordinary environment and the next filled with doubt about my ability to learn, pronounce and write correctly an entire glossary of French Culinary Terms/Skills, Commodities/Terminologies and Kitchen Control Terms, as the book is titled. All week, it has been instilled in us that this is Le Cordon Bleu and that means excellence and professionalism in all things we do: from how we work in the kitchen, how we wear our uniforms to how we refer to our Chef Tutor (Adam Newell) and how we respect each other. The high standards run through all aspects of the school. It’s a full time job procuring only the best produce from around the country. Where possible, ingredients are sourced locally which means we get to use the best olive oil, and the freshest herbs and vegetables. Only the best will do. If it’s not up to Le Cordon Bleu standards, the producer will know about it. And then there’s the cream and butter. It’s tempting to keep a running total of how much we will use over the ten weeks but hey, this is, after all a French cooking school. Class starts at 8am sharp with 16 of us perching on the seats in the demonstration kitchen in our crisp white uniforms armed with pens and our textbooks and not an iPad in sight. It just feels right to be taking notes by hand in books that you know will be referred to again and again and maybe even passed on. Chef asks each of us to give a brief bio. Students come from England, Scotland, USA, Mexico, Brazil and New Zealand and range in age from ….. well let’s just say the youngest is 18. 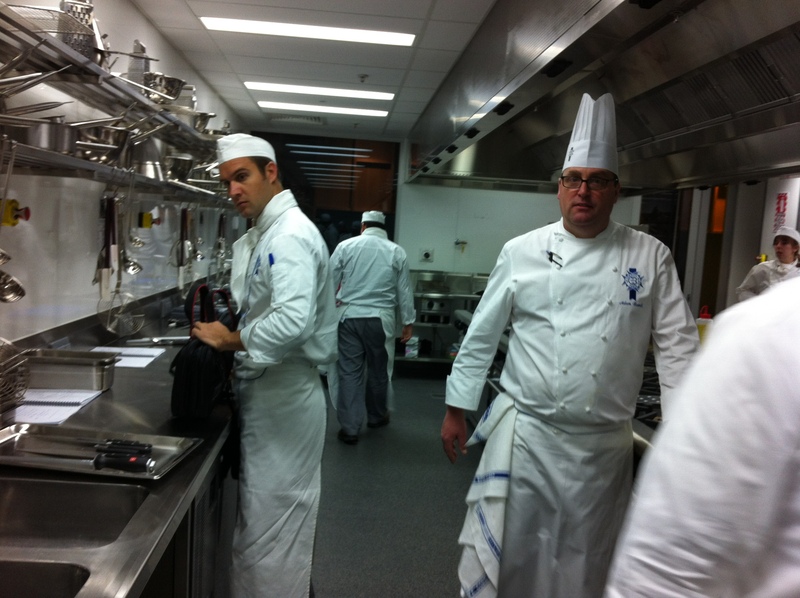 Some already have extensive kitchen experience but want to build on their careers with the prestige Le Cordon Bleu qualifications. 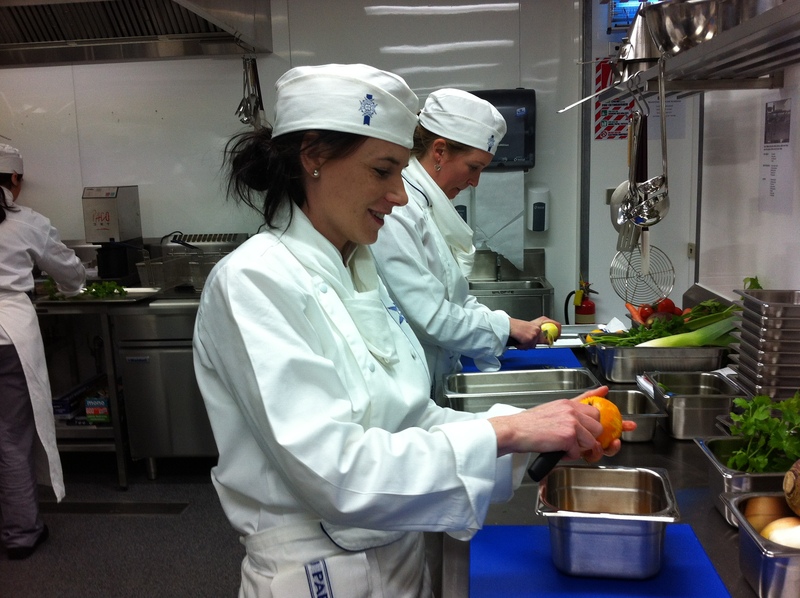 Others have packed-in day jobs in the knowledge that if they succeed, the Le Cordon Bleu qualification will open many doors into the food industry. Lesson one is pretty much knife day and as overwhelming as most first days can be. A two hour demo from Chef includes how to zest and fillet citrus, the various traditional French cuts of vegetables, and coring, blanching, deseeding and chopping tomatoes. Anything that isn’t exactly the right shape or able to be cut into the right shape is declared “not good enough” by Chef and put into the Mirepoix – the mix of vegetables for our stock tomorrow. Any with the slightest of blemishes are discarded. His vast experience and precision with knives, well in fact all things related to a kitchen and ‘cheffing’, is clear but understated. He is a Michelin star chef, owner of Zibbibo and our mentor and assessor for the next ten weeks. I’ve done julienne carrots before. When wheels just won’t suffice I’ve dusted off the mandolin and sliced through them in no time. But we won’t see a mandolin at this school. Chef shows us julienne, brunoise, paysenne, macedoine, jardinière, persil hache, tomates concasse, bouquet garni and sachet. Great, so I know about julienne and bouquet garni but the rest is all new. I take what I think are good notes throughout the demonstration and feel up for the task when we get into the kitchen for the first of 30 practical sessions. I set out all my utensils and knives (mise en place – everything in its place) and the trays of whole unpeeled vegetables are handed out to each student. Everything I thought I had absorbed in the morning demo has gone completely out of my head. What is the difference between julienne and jardinière? Is the paysenne the dice or is that the macedoine? I remind myself that I used to do live radio. Surely I can keep calm enough to cut up some veges to the required standard. Even deep breathing doesn’t relieve the pressure I feel. I can feel the change in the dynamics in the room. Previously friendly cheery voices develop a bit of an edge. There are furtive glances at other people’s chopping boards – how do my cuts compare? Are they perfect because ‘good enough’ will not be acceptable. We all eventually produce stainless trays displaying our work. Chef visits each work station and gives us encouraging feedback. He’s positive and understanding but I just know the pressure will rise over the next few weeks and the demands will be much greater. I walk out of the kitchen completely drained but knowing that I will always do a bouquet garni Le Cordon Bleu way, that blanching, peeling and deseeding tomatoes is so worth the effort and that tomorrow the heat goes up. We’ll actually be cooking. Congratulations Heather on surviving your first week. I found myself getting nervous just reading your blog post! What an incredible experience. I look forward to hearing more about life within Le Cordon Bleu. All the best for week 2! Thanks Rebecca. I will also be posting about lesson 2 and 3 before the end of the weekend. Thanks so much for the run down. I can feel your emotions – up and down – and rooting for you all the way. Aside from deep breathing – try focus on doing your best not wondering if your best is better than the rest. Learning new stuff is hard but am sure that Chef will be the perfect guide. Look forward to hearing more soon. What fun! And what an experience! Brings it all back to me when I did the course in London. As to your emotional roller-coaster – just remember, you were an absolutely awesome cook before you took this on. So you will be totally stellar once you have completed the course. You are a total star, so well written and had me on the edge of my seat, sounds just a tad more serious than the cooking classes I try And squeeze in on holiday! A great start Heather. Can’t wait to read more.